Our ‘Royal Gold’ Combination is a thrilling flowering combo guaranteed to please and to grab attention. The brilliantly bright blossoms of Bidens Mexican Gold are heat and drought tolerant, as well as being self-cleaning. Their daisy-like, trailing blossoms are compatible with the white daisy-ish blossoms of Scaevola Bombay White, also a trailer and one that is very cold tolerant, blooming well into the fall. And finally, Petunia Seguna Burgundy adds the “royal” to this combination, being rich, vibrant, velvety purple, the “thriller” in this flowering combo. The plants in our 'Royal Gold' plants are grown and shipped in fine quality growing medium and are guaranteed to arrive alive and ready to thrive. 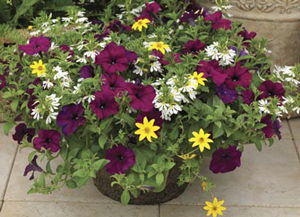 Comment: I planted 4 of the Royal Gold Combo plants in a 21" barrel planter and the flowers are doing great. The color combination looks great together. Thank you GrowJoy for beautiful, healthy plants!